After dropping out of Stanford in 1995, Musk started Zip2 with his brother Kimbal using $28,000 borrowed from their father. In 1999 it sold to Compaq for $307 million, with Musk earning $22 million. Musk invested $10 million of his Zip2 proceeds into founding X.com, one of the first attempts at online banking. It later merged with Peter Thiel’s Confinity and became PayPal in 2000. After IPOing in 2002 it was sold to eBay the same year, Musk made $180 million from the sale. Post-PayPal, Musk invested all of his proceeds into his new projects: SpaceX ($100 million), Tesla ($70 million) and SolarCity ($10 million). By 2008, he was almost penniless and living on $200 thousand monthly loans from his friends after a $20 million divorce. 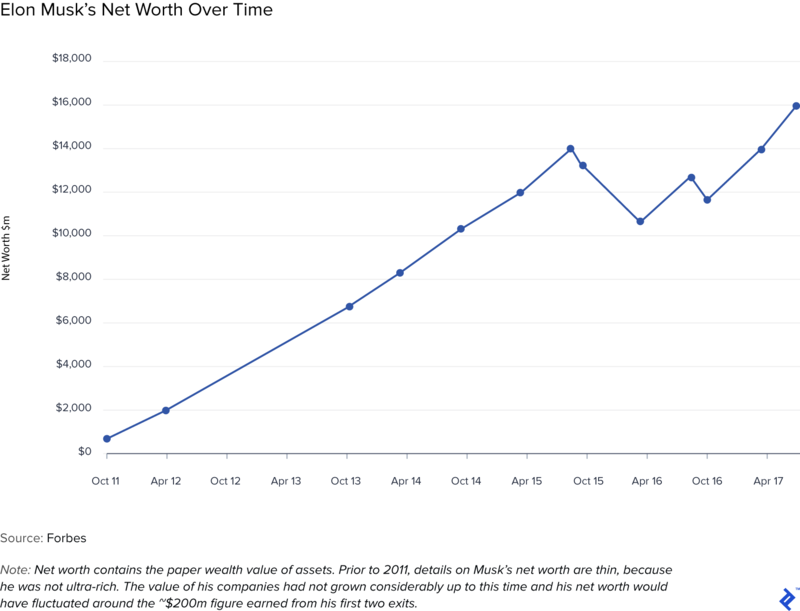 By 2017, his fortunes had changed and his net worth had risen to $16 billion; just six years earlier, it was only $68 million. After being outmaneuvered in the boardroom at Zip2 and PayPal, Musk began to take more of an iron grip with managing his companies. At Tesla in 2007, he converted $8 million of preference stock to weaker common stock just to oust its CEO. Aside from small angel investments, he avoided cashing out of his businesses at opportunistic or exit stage moments and maintained large ownership percentages. His proceeds from Tesla’s IPO were only $15 million. Musk has personally borrowed over $620 million that he has used to purchase more stock in his companies. In 2013, he drew down a personal loan to buy stock and help Tesla pay off one of its own loans. Investing within his network has provided Musk with a successful angel investing record. He made a $90 million return from DeepMind and only one of his investments has been a total loss: Halcyon Molecular in 2012. Over his career, he has been involved in four businesses with his brother Kimbal and two with his cousin, Lyndon Rive. His businesses regularly cross paths and transact with each other. SpaceX has purchased over $250 million of SolarCity’s bonds and Musk has personally bought $65 million. These kinds of links were a worry for investors during the Tesla and SolarCity merger. By 2015, Musk’s businesses and their customers had benefited from $4.9 billion in savings from government subsidies. The benefit split between the two was 70% and 30% respectively. Within the aforementioned benefits were $517 million in Zero Emission Vehicle credit allowances that Tesla sold to rival automotive producers. This allowed Tesla to boost revenue at opportune times. A $1.6 billion contract from NASA in 2008 helped stave off bankruptcy at SpaceX. A dilettante, or a brave maverick? Musk’s hands-on and all-encompassing roles have led to cries of poor corporate governance within his businesses. This issue was raised by a group of Tesla shareholders in a 2017 letter to him. Capitol Hill lawmakers have also raised concerns about federal money paid to SpaceX being used to inadvertently prop up SolarCity. Dissention was once again abruptly quieted on a May 2018 earnings call when Musk stopped taking questions from Wall Street analysts on "shorter-term" issues like Model 3 production and cash flow in favor of questions from a retail investor more interested in the bigger picture. Since founding Zip2 23 years ago, Elon Musk has gone on to start another two businesses and invest in countless others. He is one of the most admired leaders in the world, gaining respect for the ambitious nature of his activities and sheer dedication towards ensuring that they succeed. His endeavors naturally receive a lot of press, and countless armchair analysts pore over the viability of self-driving cars or if mankind can colonize Mars. In this article, I am going to leave those pontifications aside and purely focus on Musk the investor. What are the tactics and game plans that he follows when funding his companies—or, indeed, other people’s companies? What are the lessons we can learn from his investment track record and success? If you are interested in a deeper look into his background and the companies that he is involved in, I highly recommend Tim Urban’s writings on Musk and his businesses. To do this, I will first lay out the career of Elon Musk’s investments and entrepreneurial activities from a high-level perspective, and then review the trends and tactics that he has followed. In researching this, I found that Musk clearly learns from his mistakes and experiences, adapting his future actions thereafter. After dropping out of Stanford in 1995, Musk founded Zip2 with his brother Kimbal using $28,000 borrowed from their father. It was intended to be an online consumer version of the Yellow Pages linked to mapping visuals. After VC Mohr Davidow later invested $3 million, Musk was relegated to the role of CTO and the business pivoted towards a B2B offering aimed at newspapers. With his ownership diluted to 7%, his influence waned over the direction of the business and eventually in 1999 it sold to Compaq for $307 million; Musk earned $22 million from the deal. In November of the same year, Musk invested $10 million of his Zip2 proceeds into founding X.com, one of the first attempts at online banking. In March of 2000, it merged with Peter Thiel’s Confinity platform, which was its major competitor at the time. Later that year, Musk was again ousted as CEO, this time by Thiel (but he remained on the board) and the business rebranded to the now ubiquitous PayPal in 2001. By February of 2002, the business had IPOed, but then eight months later it was bought by eBay for $1.5 billion and Musk pocketed $180 million from the sale. With a batting average of 1.000 from successful startups, you would have expected Musk to perhaps take a step back after the PayPal sale. Instead he entered into a grueling phase of his career which can be characterized by the running of a string of concurrent entrepreneurial ventures. As with X.com, he didn’t waste any time after the PayPal sale and he established SpaceX in the same year. In April 2004, Musk first dipped his toes into the world of Tesla through a $6.35 million investment in its Series A round. At this point in time, he was also continually investing into the formation of SpaceX and he was following on in future funding rounds of Tesla with rising largesse and frequency. Despite not “founding” Tesla, his influence rose continuously, stemming from his invaluable operational and financial input. Moving on to 2006, following Musk’s suggestion and encouragement, his cousins Peter and Lyndon Rive established SolarCity. Musk invested seed capital into the business and assumed the role of chairman. He followed on in three more subsequent rounds between 2007 and 2012. 2008 was a nadir for Musk and potentially the most pivotal point of his career. He was fighting on three fronts to build companies with significant scope and ambition. From a liquidity perspective, his situation reached a flashpoint, with the seemingly infinite PayPal money now reaching its end. A divorce from his first wife also added a $20 million bill that year. Through loans from friends, Musk managed to continue on his course and some unexpected gifts arrived via the first proceeds from his angel investing portfolio (Everdream and Game Trust). Tesla’s IPO in 2010 marked the end of this era and allowed Musk to consolidate financially and move onwards with his evolving strategy. With Tesla starting to turn the corner, now was the turn of SpaceX, which began to get positive traction through successful trials and contracts. The realms of his three companies began to slowly intertwine, in terms of deals between them and their common narrative of forging a sustainable future for mankind. Indeed, despite IPOing in 2012, four years later SolarCity merged with Tesla, with the apparent synergies and vertical integration opportunities receiving blessing from 85% of shareholders. In this period, Musk’s angel investing took a turn towards AI and biotech focused startups. He parlayed a significant return of $92 million from an investment in DeepMind (bought by Google) and made other investments into the sectors via Halcyon Molecular, Vicarious, and NeuroVigil between 2010 and the present day. A summary of each company that he has invested in or founded is shown with more detail in the table below. The only evidence of a Musk investment being a complete flameout is that of Halcyon Molecular, which burned through investors’ cash and shuttered within 2 years. Of his exits, two were strong successes (Everdream and DeepMind) and two returned their capital (Game Trust and OneRiot). Of his current “live” portfolio, he will be sitting on some significant paper gains from his investment in Stripe. At the other end of the spectrum, Mahalo which now exists as Inside.com has been an investment of over 10 years for Musk and, despite various pivots, is unlikely to provide a successful outcome anytime soon. I see Zip2 and PayPal as being vital lessons in Musk’s approach to management and control that he learned from and applied to his future ventures. The introduction of external venture capital and dilution of his own shares meant that Musk was powerless to resist being ousted as CEO of Zip2. Despite becoming a rich man from the successful sale, its outcome disappointed Musk, as he was unable to carve the company into his vision. Likewise at PayPal, he had significant largesse from his shares and status of founder of X.com, but again he was ousted as CEO. This happened while he was on holiday in Australia, over a dispute over whether to use Microsoft or Unix technology for the platform. In the next phases of his career, Musk took an iron grip over his investments and influence. He followed-on in Tesla’s funding rounds to maintain his percentage ownership. Also, during a dispute with Tesla, he wasn’t afraid to potentially sacrifice economics for the sake of control, when he converted $8 million of preference stock into common in order to oust CEO Martin Eberhard. Despite not technically founding Tesla, Musk’s hands-on approach and influence meant that he eventually assumed the role of CEO in 2008. Musk has continually plowed his net worth back into startup investing. Portfolio analysts would baulk at such a strategy (2% is recommended for venture capital within a normal portfolio allocation), but this has always been Musk’s mantra. It’s as if he takes the view that any net worth generated from startup sales is apportioned out from his other assets and reallocated into venture/startup investing. Immediately after Zip2 and PayPal, he was already founding and funding his next ventures. This is a sign of a confident investor and one that gives rise to a view that Musk believes that he has an advantage investing in himself, or others as an angel. He likely feels that he has an element of control over the outcome of the deal, which would not be true for a passive strategy of investing in public equities or real estate. Achieving two successful outcomes from his two first ventures will have given Musk an unrivalled confidence in his ability to invest and operate, it just feels right to him. 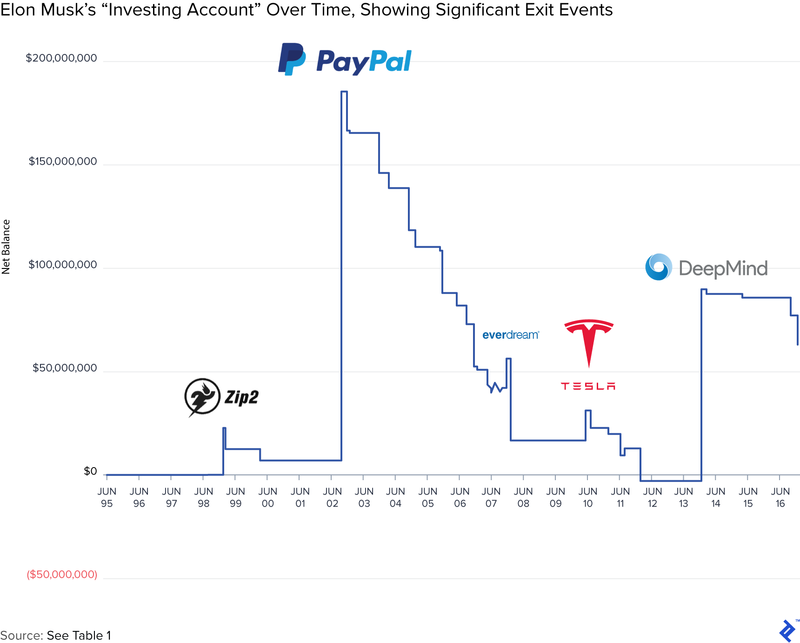 The chart below shows an attempt at tracking Musk’s “Investing Account” over time. It shows his investments and proceeds (purely capital gains from exit events - not compensation) over the years. Post-PayPal, you can see how he largely spent all the proceeds over the following ten years. Also noteworthy is that he has not received significant exit returns from SpaceX, SolarCity, or Tesla. SpaceX is still a private company; at SolarCity’s IPO, Musk sold no stock, and at Tesla’s IPO, his proceeds amounted to $15 million. Even to this date (2018), he has never reduced his net share position in Tesla. In fact, in May 2018, following a contentious earnings call that seemed to spur on some short sellers, Musk bought an additional 33,180 TSLA shares, boosting his stake to nearly 20%. When news leaked from court filings of Musk’s divorce in 2010 it transpired that earlier in the year Musk had run out of cash. His voracious appetite to continue investing into his businesses resulted in that, despite significant paper wealth, his liquid assets were minimal. Back in 2008 during hard times at Tesla, he even cobbled together his next financing by immediately flipping proceeds from the sale of Everdream (one of his angel investments) directly into Tesla’s next round. One such example that shows how personal borrowing provides Musk with a powerful financing mechanism is from 2013. 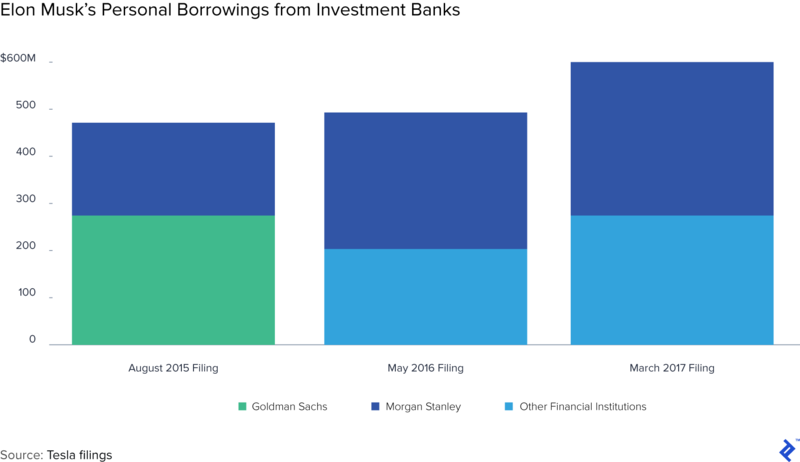 With the maturity of a loan from the government approaching, Tesla took to the capital markets to raise new equity to fund the principal repayment. Musk took out a $150 million personal loan from Goldman Sachs to fund buying new stock in the round. In an abstract way, he rolled a part of Tesla’s loan onto his personal balance sheet. So aside from investing most of his net worth into his businesses, Musk also borrows to leverage more exposure. Because he takes an insignificant salary from his businesses, his goals are completely aligned towards increasing shareholder value. As a key human pillar in his businesses, investors also take comfort seeing him continually investing in them. His risks from this are such that, if Tesla stock starts to underperform, he may be required to pledge more and/or different types of collateral. 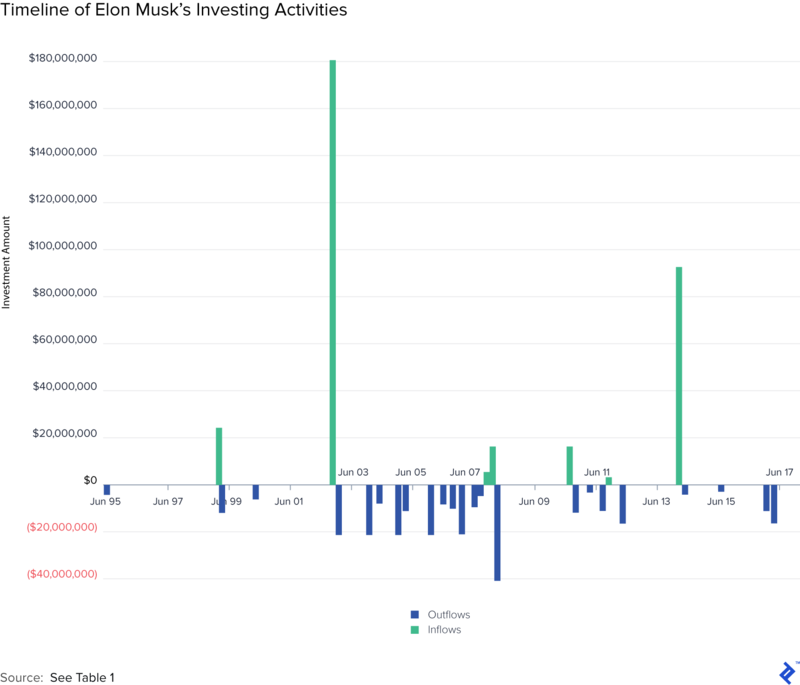 Looking at Musk’s angel investing portfolio is again interesting, for his success rate, entrance patterns and sectoral strategies. 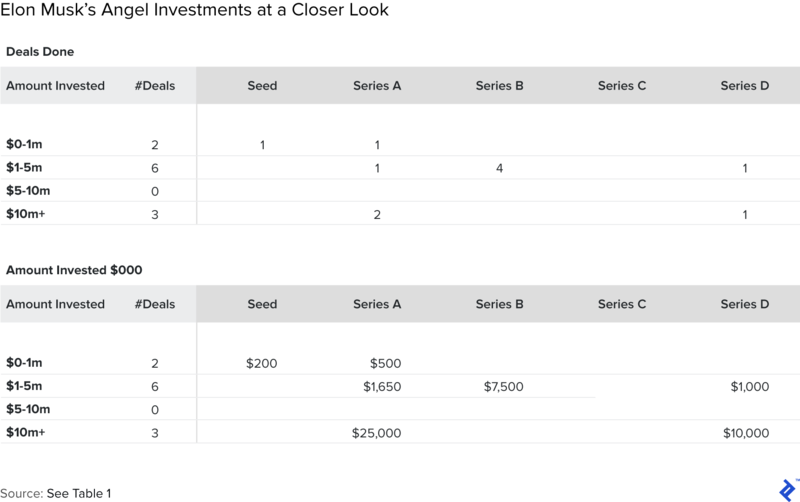 He appears to be stage (and at one time sectorally) agnostic in his angel investing, ranging from deep Series D entrances, to seed round punts. Although Series A investing does seem to be his favored round. Musk invests in what he knows and with people that he knows and trusts. The effect of this has been that, through this natural rapport, he can have more influence on his investments beyond the traditional board and control mechanisms offered to investors. The reciprocity works both ways, as his network has rallied to support him, either through investing in Musk’s companies or in 2010 when he was living on loans of $200,000 a month from his wealthy friends. Musk took these relationships a step further by instigating the merger of Tesla and SolarCity. Benefits of synergies and economies of scale were touted behind the reason for the merger, with $150 million of cost savings slated for the first year. However, the genesis of the idea was bigger-picture, and aimed at vertically integrating their processes, sharing ideas and cross selling to their customers. After working directly or indirectly in three distinct businesses for the majority of the new millennium, merging two of them together would formalize what was already standard operating procedure for Musk. Considering that both companies operate within nascent markets, a merger together doubled down the risk and potential reward for Musk, the eternal gambler. Daniel Gross describes his control mechanisms as that of a Japanese keiretsu. SpaceX has purchased over $255 million of SolarCity issued Solar Bonds as corporate investments. 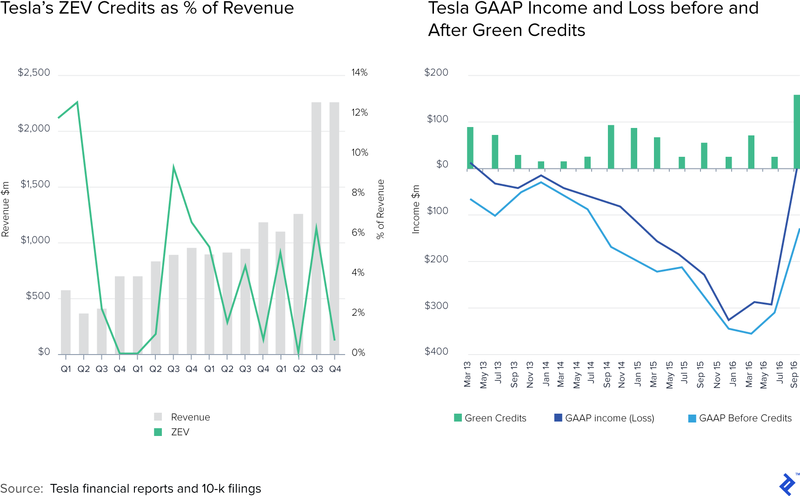 SolarCity’s business model requires cash up front to fund its activities, while SpaceX largely has chunky cash balances from its funding rounds, or pre-paid contracts. In this arrangement, SpaceX has been able to earn an attractive yield and SolarCity has secured vital financing cash flows. Musk himself has also personally invested $65 million into the same bonds. It should also be noted that this program is an innovative financing solution within itself. SolarCity purchased fintech firm Common Assets in January 2014 to build an online platform to allow for retail investors to buy Solar Bonds. The Boring Company is Musk’s most recent new venture, describing the tunneling operation as a “hobby.” However it is a venture that could theoretically provide benefit to Musk’s existing businesses alongside standalone tunneling projects, most notably for Hyperloop projects. In May 2018, Musk posted that the Boring Company’s first tunnel, which runs beneath Los Angeles, is almost finished. 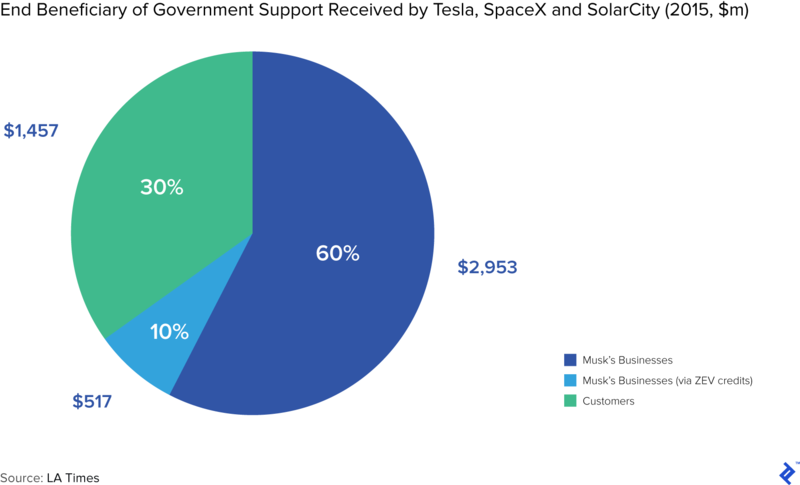 As of the Summer of 2015, the LA Times calculated that Tesla, SpaceX, and SolarCity had received $4.9 billion in government support. With the largest contributions arriving that same year. In 2015 alone, the Nevada government pledged support via tax breaks of $1.3 billion for a Tesla Gigafactory in its state. The New York government engaged in similar support of $750 million for a SolarCity factory in Buffalo. While these headline figures suggest that Musk has received a significant leg-up from the government, reading into them tells a more nuanced story. With SpaceX and SolarCity being significant players in renewable energy, government assistance is to be expected. Electrek’s deeper look into the LA Times figures also suggest that this was by no means free money and the Nevada and New York factories are tied to significant performance targets and spending pledges, and they contain punitive clawbacks. The chart below shows the LA Times’ $4.9 billion figure apportioned out by the end-beneficiary of this alleged government support. The breakdown of this quoted amount shows that consumers actually were the beneficiary of 30% of these subsidies via tax breaks and rebates, to encourage renewable adoption. Sure, Musk’s companies also benefit from these initiatives, in that they position their products in a more cost-attractive way to consumers, but it is in no way free money. 10% of these subsidies have also arrived with the help of Tesla’s competitors, in the form of Zero Emission Vehicle Credits in California. According to the LA Times’ data, at the time of writing Tesla had banked $517.2 million through selling its own ZEV allowances. With its entire fleet being electric, this is a savvy and no-brainer strategy for Tesla, which on a strategic level also allows them to take money directly from the pockets of competitors via the sales. SpaceX has received scant assistance in comparison to SolarCity and Tesla, but its largest customers are governments. A contract from NASA for $1.6 billion essentially saved SpaceX from falling out of existence in 2008. Maintaining relationships with federal agencies is critical for SpaceX’s growth, as these lumpy contracts provide the financial backbone that funds the operation. In recent years, Musk has followed a policy of open-sourcing his research idea. Because of how widely followed and listened to Musk is, I see this as a clever way of him taking his hands off the wheel and outsourcing R&D in a cheaper and potentially faster manner. In August 2013 Tesla released a white paper called Hyperloop Alpha, detailing initial research and concepts into a potentially revolutionary mode of transport. It was a no strings attached invitation to other entrepreneurs to go away and try to build upon the idea. This benevolent gesture captured the imagination of the public and a number of emergent Hyperloop startups then emerged. One way Tesla supports this initiative is via its Hyperloop Pod Competition. This was a smart way of an already stretched Musk to outsource the initial formation of the Hyperloop ecosystem. A clean method of transport that could conceivably harness Tesla and/or SolarCity services when in operation. Also in January 2017 Musk invested in Hyperloop Transportation Technologies (Pitchbook), which now provides him exposure to the venture without having done the initial heavy lifting. Waiting for upstarts to emerge also gave him optionality to wait and see about who to invest in. Musk’s heavy handed tactics and attitude have received criticisms over the years. Corporate governance and conflicts of interest are two issues that Musk walks a tightrope on. The track record and respect that Musk holds offers him an element of deference from shareholders. In April 2017, public investors in Tesla wrote to Musk raising their concerns about corporate governance at Tesla. Directors in Tesla were only being elected every three years, were largely unchanged from pre IPO days and had a number of links to Musk’s other companies. There have also been arguments that his transactions with SolarCity bonds for himself and SpaceX smacks of double dealing. SpaceX’s dealings with SolarCity have also attracted attention in Capitol Hill, with lawmakers raising concerns that federal contracts for SpaceX’s services could be surreptitiously propping up SolarCity. Various other commentators, obviously with their own agendas, have labelled Musk as a dilettante and his associated businesses as Hype Machines and Ponzi Schemes. As a man who has been described as the best “CEO of Social Media,” his public and candid persona endears him to followers. His commentaries about Tesla’s share price have been called strangely accurate, which again raises concerns about undue influence. It also transpired that his comments about The Boring Company being commissioned to dig Hyperloop tunnels may not have been as truthful as he had implied. The stardust surrounding Musk throughout his career may also lead to him perceiving himself to be infallible. The issues surrounding the ramping up of Tesla Model 3 production culminated in an incredibly hostile call with Wall Street analysts in May 2018. Shooting down legitimate questions about production and burn rates with a retort that the questions were “boring, not cool and so dry” was at best immature and at worst reckless for a CEO of a $45 billion company. He later apologized for his behavior calling it “foolish” however, he continued on by explaining why the questions weren’t worth answering - a classic non-apology, apology from Musk. Musk then engaged in some mindless banter with Warren Buffet about the existence of moats in the candy industry - an unnecessary distraction that Musk didn’t need to encumber himself with during critical times for Tesla. This whole incident gives credence to arguments that he has been surrounded by “yes men”, leading to this “emperor’s new clothes” effect that he can do no wrong, nor address concerns constructively. In my opinion, Musk is a victim of running a company that is listed on the public markets. Tesla is an automotive company that is priced and treated as a high-growth technology company. Musk’s maneuvers point to the actions of a private company CEO who will hustle and do anything to ensure the financial survival of his businesses. His plans to only IPO SpaceX when there are regular flights to Mars are telling, in that he doesn’t want the distractions of being a public CEO, he just wants to grow his businesses. 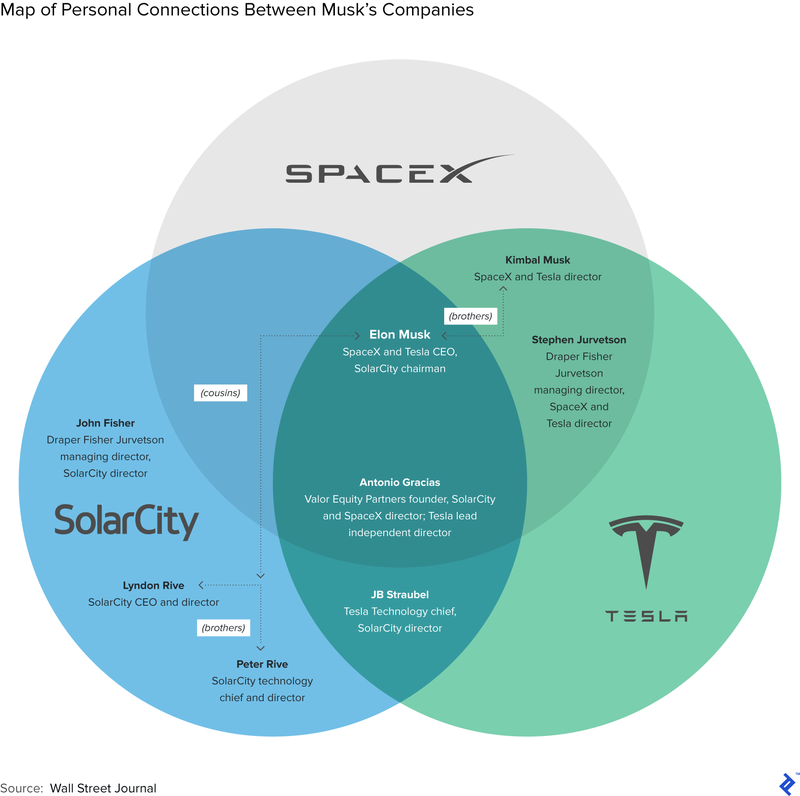 Elon Musk is the largest shareholder in SpaceX and Tesla (which merged with SolarCity in 2016). In addition, he has personal investments in five other private startups. He has founded and sold two other companies: Zip2 and X.com (which became PayPal) and exited five previous angel investments. How much did Elon Musk get for PayPal? Musk is quoted as saying that his proceeds from PayPal’s sale to eBay were $180 million. Of that amount, he famously invested all of it into his future businesses. $100 million was allocated to SpaceX, $70 million into Tesla, and then $10 million for SolarCity. What is the education of Elon Musk? In 1989, Musk enrolled at Queen's University in Kingston, Ontario before transferring after two years to the University of Pennsylvania, in the USA. He graduated with two majors (Physics and Economics). At 24, he enrolled at Stanford University for a PhD in Applied Physics, but dropped out after two days. Where does Elon Musk come from? Musk was born in Pretoria, Transvaal (now Gauteng) in South Africa on June 28, 1971. In 1989, when he was 17, he moved to Canada. He holds South African, Canadian, and American citizenships. In July 2017 SpaceX raised $350 million of equity capital at a valuation of $21.2 billion. Very thorough and interesting. Thanks. Anybody wanna speculate on what the recently purchased x.com will turn into? My guess is a cryptocurrency with smart contracts similar to Ethereum. Good point. My first reaction is probably nothing, as he said it has 'great sentimental value' to him. For that he might just use the site as a personal asset - blogging/promoting his philanthropic causes etc I have not come across many sources linking him to crypto, but based on the legacy of X.com it would be the logical choice that its next reincarnation would be within the payments space. How does any of this help anyone? One of the best articles on the topic of investments from Elon that I saw. I enjoyed everything! Can't believe how brave he is and how stupid love taught him to become a strong-willed maverick.